Horses have always been Alex's obsession. Their presence has defined her life: all her choices, from her love-life to her career, have been made with horses as her priority. But the horse business isn't for the sentimental, and it's growing harder for her to tamp down her emotions and think about the horses with her head and not her heart. When their racing stable suffers a loss, she and Alexander, her partner and teacher, slowly begin to fall apart. A chance find of a long-lost horse sends Alex alone to New York City, and she wonders if this is the sign she's been waiting for. Is it time to leave it all behind and start fresh? From the green hills of Ocala, where horses graze beneath centuries-old live oaks, and the rhythmic sound of galloping hooves fills the foggy mornings, to the cracked pavement of New York City and the swirling cold winds of Aqueduct Racetrack, Alex finds herself in a whirlwind weekend that tests all of her convictions. 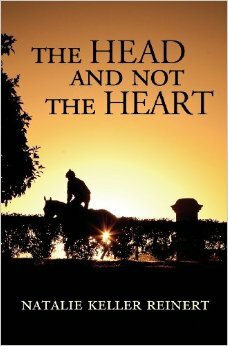 Dealing with love, loss, and obsession - all the components of a life with horses - "The Head and Not The Heart" brings the world of racehorses and the people who love them to life.